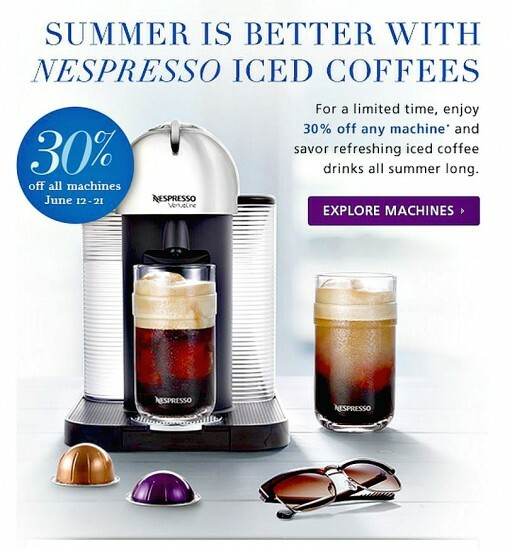 Under the heading of “SUMMER IS ALWAYS BETTER WITH NESPRESSO ICED COFFEES”, the sale is good for 30% off any new Nespresso machines beginning today June 12th and running until next Sunday, June 21st (11:59 PM PST). Not bad timing as New York is going through some early muggy summer weather that doesn’t look like it’s going to let up. This shouldn’t come as much of a surprise as Nespresso ran a sale on their machines during Father’s Day in 2014. Nespresso rarely discounts their machines where you can actually save real dollars. More often, the company offers club credit when you buy a machine; usually $75 or $100 store credit for purchasing pods or accessories so this is a good time to jump on a Nespresso machine if you’re in the market for one. The sale is good on all Nespresso machines purchased between 6/12/15 and 6/21/15 Nespresso’s official website, Nespresso ® Boutiques and retailers.